A scene from “Kill Local” at the La Jolla Playhouse. It’s a small family business, established by a close-knit mother and her two daughters, after the untimely death of their beloved father. Everyone’s gotta make a living, right? Their gig is Murder for Hire. In some twisted way, they believe they’re doing what’s right (though the mother does admit to having no morality). In the end, though, what goes around comes around. I won’t say more. I don’t want to spoil the fun of this offbeat, darkly humorous new work by the talented Mat Smart, an alumnus of the UC San Diego MFA program in playwriting. My first exposure to his writing was his striking 2004 creation, “The Hopper Collection,” written when he was a grad student. It went on to have a professional staging on each coast. And Smart went on to receive awards, fellowships and commissions, including one upcoming for the La Jolla Playhouse and The Second City. It’s exciting to welcome him back (this play was part of the Playhouse’s DNA New Works series last year). Now we all get to see the nerve-jangling world premiere of “Kill Local,” expertly and suspensefully written in the vein of the violent, pitch-black ‘comedies’ of Quentin Tarantino or the Coen Brothers. Blood will flow (and spurt). The plastic-sheet curtain is an early warning sign. There will be murder … and maiming. Even errant body parts (keep your eye on the hacksaw). 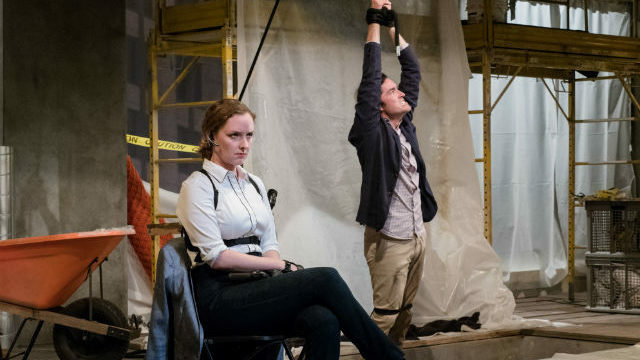 At all times, the play is deliciously unpredictable and amusingly macabre. The first scene is a stunner. 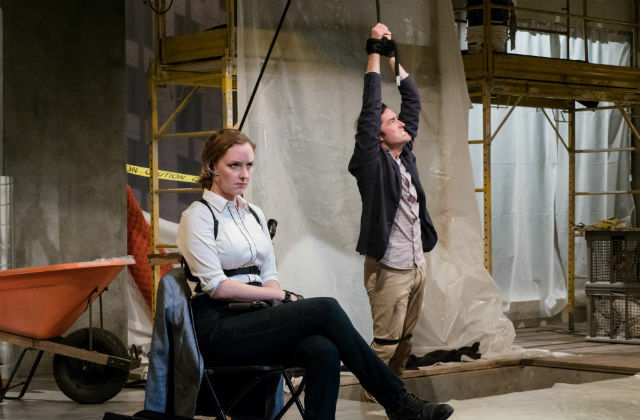 On an upper floor of a high-rise building still under construction, a man hangs by his wrists over a pit of sorts (perilously close to a wheelbarrow full of concrete), swinging, complaining, cajoling and begging for his life, as a woman with her back to him focuses on her cellphone (she’s ordering takeout from Chipotle) and keeps her firearm close. We know he’ll be the first to go. He certainly won’t be the last. The dialogue is crisp and credible. Under the taut direction of Jackson Gay, with loads of hair-raising special effects, the production is superb and the cast is exquisite. We get a very good sense of these five flawed, warped and dangerous characters. But it’s not all blood and guts. While Todd hangs and pleads for mercy, vowing to change his nefarious ways, Sheila is having second thoughts about her own career choice. The joy has gone out of her work. So the ultimate question the play poses is: Can anyone change? Can a bad person turn good? Can an assassin walk away from a lifetime of enjoying the sport of the kill, and have a “normal” life, with two kids and a minivan? The query is intriguing; the answer proffered is not all that encouraging. But you’ll happily go along for the neck-snapping ride. Amanda Quaid is marvelously forceful — and uncertain — as Sheila, the older daughter who’s following most closely in her mother’s brutal footsteps, but edging into an existential crisis. Xochitl Romero is charmingly innocent as Abi, the daughter who manages the office and intel, given her MBA from Wharton. She doesn’t usually go out in “the field.” But this day, and this job, turn out to be unique for all. Even malevolent, manipulative Mom shows up, in the person of chilling, unflappable Candy Buckley, who gives an electrifying performance. Then there’s the first victim, Todd (Matthew Amendt) who, after a lifetime of real estate conning, bilking and fleecing, is re-thinking his life and wants to be given another chance. No chance, with this family. Finally, we meet Carolyn Braver as young high schooler Ami, who seems so naïve, just having wandered in accidentally. Um, no. ‘Nuff said. Amid a bevy of Biblical and religious references (concern about the likelihood of going to Hell plagues more than one character), the play asks another big-theme question: In the face of all this treachery and duplicity, can revenge be jettisoned (how many eyes for how many eyes, after all?) and replaced with forgiveness? In this devious, double-dealing cluster, each person has an idiosyncratic sense of justice and retribution, right up to the final, harrowing moment. It all happens in a wonderfully detailed set (Wilson Chin) that looks like it was transported directly from a construction site. The special effects are terrific. The lighting (Paul Whitaker), costumes (Jessica Ford), sound (Broken Chord), and fights (directed by Steve Rankin) are all of a perfectly synchronized piece. If the grisly is your gruel — peppered with fiendish humor — feast on this. Performances are Tuesday-Wednesday at 7:30 p.m., Thursday-Saturday at 8 p.m., and Sunday at 7 p.m., with matinees on Saturday and Sunday at 2 p.m.
Running time: 2hrs. 20 min.